Storms are getting worse and more frequent it appears. Every week there seems to be flash flood warnings throughout Delmarva. A lot contributes to this, and it seems it’s only going to get worse. I shouldn’t be so Debbie-downer, so let’s look to nature for some help in dealing with wet feet. Let’s go with the flow and talk about wet-tolerant plants, perfect for wet environments, pond edges, and rain gardens. Bald Cypress (Taxodium distichum): a magnificent deciduous conifer—a cone bearing tree that loses its needle-like leaves in autumn. This tree actually thrives in wet areas and can be found along rivers, lakes and pond edges, as well as in swamps, coastal marshes, and river bottoms. 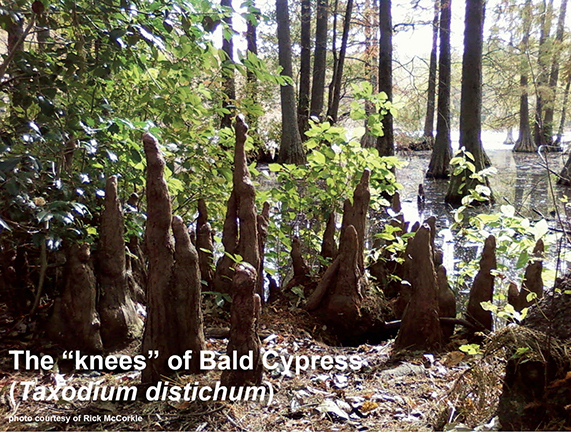 A unique feature of the bald cypress is its “knees” that form only in wet areas. An outstanding example in Delaware is the Cypress Swamp in Trap Pond State Park. Hauntingly beautiful, it is the northernmost stand of naturally occurring bald cypress. Red Maple (Acer rubrum): a beautiful deciduous tree that turns shades of golden yellows to flaming orange and reds in the fall. The red maple naturally occurs in wet areas and is tolerant of many soil types. It is more often multi-stemmed in low, wet areas but can grow from 50 up to 100 feet tall at maturity. When driving along the highway in the early springtime, you might see a reddish haze on the tree tops nearby. That is the red maples’ buds beginning to swell and preparing to leaf-out, a sure sign of warmer days ahead. Atlantic White Cedar (Chamaecyparis thyoides): a handsome evergreen tree that is characteristic of fresh water swamps and bogs. Growing up to 50 feet in height, it is more on the slender side with a diameter averaging 15 feet. It does well in garden situations, but does not compete well with hardwoods nearby. Unique in that it is a wet-loving evergreen, groves of Atlantic white cedar can be found in swamps and along the coasts from Maine to Florida. A beautiful stand can be seen at Abbott’s Mill Nature Center in Milford. Summersweet (Clethra alnifolia): A fragrant shrub found typically in forested wetlands, swamps, bogs, and coastal river floodplains, it can tolerate some flooding of partly salty (brackish) water. Summersweet is also very valuable to a variety of wildlife including songbirds, waterfowl, butterflies, and a plethora of other beneficial insects. Its sweet-smelling fragrance fills the air, especially when planted in mass and its spikes of white and pink flowers are equally enjoyable to view. Redosier Dogwood (Cornus sericea): another one of my favorites, this shrubby dogwood loves moist areas and can be found mostly in wet, swampy situations. It’s adaptable to a wide range of soil types, and similar to Summersweet, beneficial to wildlife. Another important characteristic of this plant is that it is stoloniferous, i.e., it easily spreads by underground stems making it an excellent choice on banks and other conditions that require erosion control. Perhaps its best feature is its stem color. Redosier dogwoods have brilliant red stems that are spectacular in the autumn and winter, especially with snow providing contrast. Also available with yellow stems (‘Flaviramea’), this shrubby dogwood goes a long way in the residential landscape. Blue Flag Iris (Iris versicolor): an herbaceous plant that loves wet soils, it can even grow in water up to 4 inches deep. It’s also considered deer tolerant, a plus for our area. It can colonize if left to its own devices, so give it room to spread. Naturally found in marshes, swamps, wet meadows, and ditches, it adds color and texture to the home garden. The genus, Iris, is named for the Greek goddess of the Rainbow, so there’s that, too. Swamp Rose Mallow (Hibiscus moscheutos): a fast growing perennial that has large four to five inch blooms through summer. They range from pink to white, and sometimes red. They can actually grow pretty large so give them some space. They tolerate wet soils, and naturally grow in marshes and along shorelines. For a stunning display, look no further than Canal Font Park in Lewes. Planted as part of a coastal resilient landscape, large beds of Rose Mallow can be seen in bloom during summer. Eric W. Wahl, RLA is a landscape architect at Element Design Group and president of the Delaware Native Plant Society.